The BBC has begun a trial of 4K high dynamic range (HDR) video on its iPlayer streaming platform. The test involves four minutes of footage from its Planet Earth II series, which promise to reveal more detail and present more vibrant colours than was possible before. It is part of efforts to develop technologies that will make live broadcasts in the new formats possible. But only a minority of TVs can screen the footage at this stage. 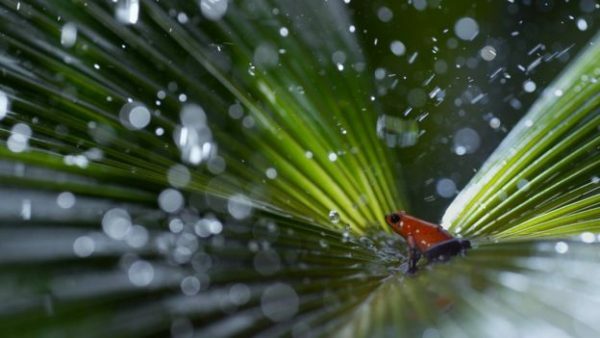 “One of the clips is a frog on a leaf with lots of rain, and the reason this is so interesting is that the redness of the frog is a really deep Ferrari red that you would never get in broadcast television at the moment,” explained Phil Layton, head of broadcast and connected systems at BBC Research & Development. “We want to show that this is how the BBC could make ultra-high definition HDR material available to iPlayer. As the trial went live, only Panasonic’s latest screens supported the test’s underlying technology – known as hybrid log-gamma (HLG). Although recent models from other manufacturers can also be updated to add the facility, it is unclear whether the firms will do so. Holding back support for HLG would give the companies an opportunity to market future models as being the first to support the format closer to when it launches. From the consumer’s point-of-view, there are two key improvements. A 4K picture – also referred to as ultra-high definition (UHD) – means that four times as many pixels are used than in 1080p HD. This makes it possible to reveal details – such as the texture of an animal’s fur or the faces of the crowd at a football match – that would have appeared more blurry otherwise. The main caveats are that the TV needs to be suitably large and the viewers close enough to it, otherwise they will not appreciate the difference. HDR takes advantage of the fact displays can go brighter than before to allow an image to be graded with more levels of brightness between black and white. This is not about everything looking brighter, but rather using the greater contrast range to allow shadows to appear less murky and highlights – such as sunlight gleaming off water or stars twinkling at night – to be better defined. In addition, HDR uses a wider colour space – meaning it is capable of showing shades of colours that could not be transmitted in traditional broadcasts, helping footage appear more lifelike. Many people who have experienced both, say that HDR has a greater impact on picture quality than 4K. “It gives more nuance to the picture, which if you are talking about Planet Earth is going to be amazing,” said Stuart Miles, founder of the Pocket-lint news site. “The best way to describe it is it’s like when you add a subwoofer to a sound system. The BBC will make the footage available via the different smart TV versions of its iPlayer app as soon as the relevant models support it. But it will be some time before it starts offering scheduled broadcasts in 4K and HDR. Mr Layton said the technological challenges could be resolved within the next 18 months. But programmes will cost more to make if they take advantage of the innovations. So, the improved quality will have to be weighed against the fact the majority of viewers will be unlikely to have TVs that support the new technologies for some time to come. In the meantime, Amazon and Netflix both offer some pre-recorded shows and movies in HDR and 4K. And BT and Sky both offer movies and sport in 4K but not HDR.